Do you want to get better wifi on your home? Well, check this list of the best tips about wifi speed booster tips. The coverage of WiFi in your home is a problem if you live in a house with several floors or a large floor with enough walls and rooms in between. Therefore, I will collect the best wifi speed booster tips and ways about how to get better WiFi at home to increase coverage, speed, signal, and stability. The most common problem is that the router is too far from the device you want to connect. Therefore, you have to analyze the placement of the router. Changing the position, even a couple of meters can radically shift the WiFi signal. Avoid surfaces or large metal panels. For example, placing the router behind the television will cause the screen to block a large part of the signal. Avoid hiding it in a drawer or putting it on a covered shelf, as you will be blocking the signal. It is recommended to move the router as far away from neighbors’ networks as possible. Keep it away from areas with many wires or halogen bulbs to avoid interference. The equidistance is essential on a router. If you have an apartment, you should try to place the router in the room that is most centered so that it reaches the rest of the floor better. In a house with several levels, it is recommended that it be on the middle floor or even on the upper floor, since on a ground floor the floor absorbs more signal, and WiFi waves tend to travel better laterally and downward. Some apps allow you to know how many networks are near you, the amount of signal that comes from your network, decibels, noise, the channel you are operating in, etc. Among them, you find some as WiFi Finder or WiFi Analyzer on Android, Wi-Fi Finder on iOS or WiFi Analyzer and Acrylic for Windows. However, the most complete is NetSpot that, through browsing your home with the computer, allows you to create a map of your home to see which are the points where more coverage is lost and thus improve WiFi. It is available for Windows and macOS. If your router has external antennas, it is convenient that you place them correctly. The most common is usually L-shaped, with one antenna pointing up and the other lying pointed to the side. You can also choose to change the antennas if your router allows it, and have some that take better advantage of the power output. The WiFi channel can be one of the factors that most affect the signal. If you live in a building and you get networks of many neighbors, they may be interfering with your network. Therefore, try switching between WiFi channels until you find one with less interference. With the programs and apps mentioned in wifi speed booster tip three you can check the decibels of the signal when you make those changes (the smaller the number, the better, for example, -30 dB is better than -40 dB). Besides, you can quickly see which channels your neighbors are using to go directly to one they are not using. The most commonly used are 6 and 11, and the channels range from 2,401 MHz to 2,473 MHz in 5 MHz jumps. 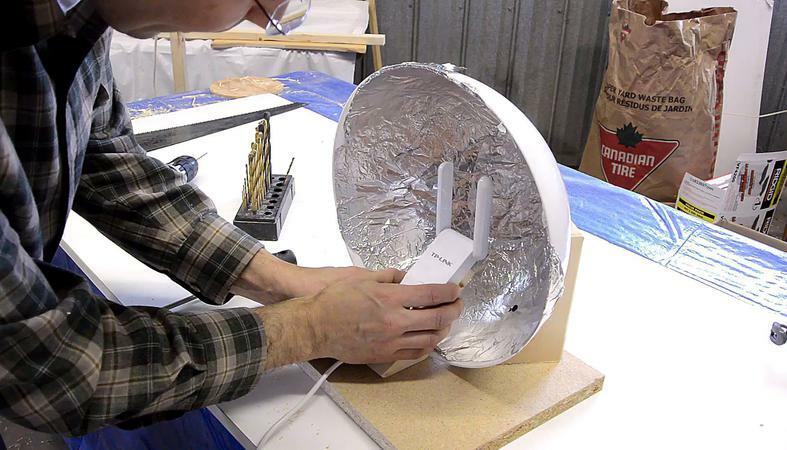 Yes, aluminum foil and trimmed can improve WiFi coverage. Being an electromagnetic wave, they behave in the same way as light. So, if you want to improve the WiFi and its coverage, you can put a can cut in half in vertical and introduce the antenna through the hole so that it stays in place or a screen of aluminum foil. If you orientate the inner metallic zone towards where you want to improve the coverage, you will notice a significant improvement in the strength of the signal. The current WiFi of most routers (especially fiber) creates two networks in your home: one that operates at 2.4 GHz and another at 5 GHz. The 2.4 GHz has a longer wavelength, so it has a more extended range. However, its speed is lower. In contrast, the 5 GHz has less range but has a higher speed. With a router with WiFi 802.11n, you will have the highest possible coverage. Standards such as WiFi 802.11ac or 802.11ad have less range. The only one that will improve will be 802.11ah, which would operate in the 900 MHz band, but has not yet arrived. If your router already has time, it is possible that your manufacturer has released several firmware updates that fix faults or improve some features. Among them, you can find the speed or range of WiFi. Some routers require manually download the firmware from the manufacturer’s website, while others are updated alone or from the panel itself. If you can’t move the router or do anything, a great option is to put a repeater. Speed ​​isn’t going to be the best, but you will increase your reach. Another option is to use WiFi Mesh. There are routers like the NetGear Orbi that allow you to connect several access points wirelessly, which act as if they were a single network (hence the mesh). There are other models such as the Linksys Velop or the TP-LINK Deco M5. Another cheaper option if you have one is to use an old router as a WiFi repeater. If you can’t do anything else to improve WiFi, perhaps a better option is to buy an Ethernet cable and throw it through a skirting board or a corrugated tube. So far those were the best wifi speed booster tips about how to get a better wifi connection on your home using easy tips that you can try to improve your internet speed. Do you now another tip? Let me know in the comment section.